Newcastle-born Gwenda and Douglas Brady were among the millions of British children sent – for their own safety – to live with new families during the Second World War, leaving behind their parents, their friends and all that felt familiar and safe. Evacuation could be a scary experience, but five-year-old Gwenda and her brother were lucky enough to be housed with a kindly schoolmaster and his wife in an idyllic Lake District village, Bampton. The realities of war soon felt very far away. 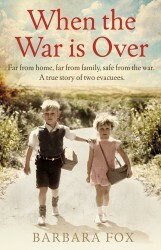 When the War is Over tells the poignant story of how Gwenda and Doug found a second family and a loving home in Bampton, but reveals how even in this remote village – seemingly protected from direct risk – no one remained invulnerable to the tragedies of war. And although it is all they have wished for for so long, will life ever really be the same ‘when the war is over’? Is the Vicar in, Pet?